China is the name of the region, naturally, based on Chinese culture. It consists of three towns: Yu Garden of the Shanghai area, Mount Song Hamlet of the Mount Song area, and Mahavira Hall of the Shaolin Temple area. The phrase "Dong Fang Shen Zhou" (东方神州), translates in English to "The Eastern Divine Land", or "The Oriental Divine Land". The salon of Shanghai's Yu Garden. Shanghai is the main area of China, with Yu Garden serving as the first town. It is a modern, urban town set during night time because of the Jiangshi that have inhabited the area. By completing quests, you gain access to quests from the other citizens of Shanghai, including daily quests that reward Yu Garden Coins. 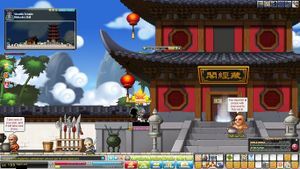 These coins can be used to purchase various items from the citizens of Shanghai, including scrolls and equipment from a special Black Market shop that appears during certain times of day. 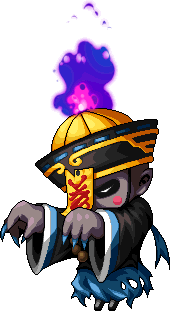 You can also spend your coins at Hugh Head's shop, where you can change the appearance of a hat or overall with Diabolic Jiangshi's hat or clothing fragments. You can also have your fortune told for 1 coin at Suan Ming, giving you a random buff that can increase your EXP, meso drop rate, Weapon/Magic Attack, or Speed/Jump. 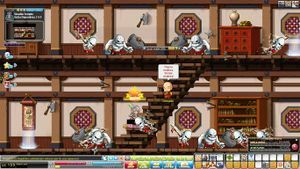 The NPCs in Shanghai sell the typical things, such as armor, potions, and weapons for levels 60 to 70. There are also NPCs that can change your face and hairstyle. This area can be accessed via the Shanghai Interdimensional Portal at Six Path Crossway on Victoria Island, which will leave you at the Residential Area of Shanghai. The first area outside of Shanghai's Yu Garden is Nanjing Road, which consists of city-style maps, with various buildings and shopping centers. Monsters that can be found here consist of ghosts that interact with the city's elements and the Shopper Jiangshi. This road branches off into two areas: The Bund and the Residential Area. End of The Bund, facing off against the Diabolic Jiangshi. Based on the real life area of the same name, this area has been inhabited by stronger Jiangshi, and is where the boss Diabolic Jiangshi resides. Residential Area, facing off against the Giant Centipede. The Residential Area consists of farm-themed maps with various farm animals which have been driven insane due to the Jiangshi appearing near Shanghai. The Shanghai Interdimensional Portal is located at the beginning of this area. The boss Giant Centipede is located at the end of this area, with the way to Mount Song located past this path. Level Range (CMS, SEA, and GMS): 145-146. Mount Song Hamlet is the second town in the China area, and is the first town in the Shaolin Temple area. It is an ancient Chinese style town that is surrounded by bamboo trees where merchants sell potions and weapons. The other features in the Mount Song Hamlet are a Free Market entrance, Hair Salon, Plastic Surgery, and Skin care. 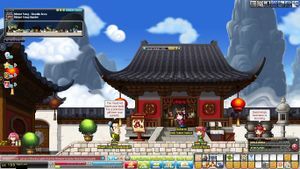 At Level 145 or higher (in CMS, SEA, and GMS), Elder Jung will contact you to start a quest chain here. Mount Song Hamlet can be accessed via the Residential Area of Shanghai. * indicates that the monster is not available in TMS or JMS. Mahavira Hall, at the entrance of the Sutra Depository. Mahavira Hall is the third town in the China area, and can be reached by foot from Mount Song Town. The entrance to the Sutra Depository can be found here. 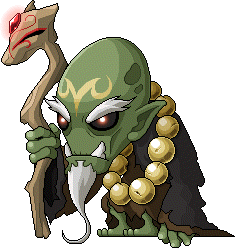 Elder Jung asks you to investigate the Shaolin Temple area and the demons that have inhabited the Sutra Depository, helping the Wise Chief Priest. Inside of the Sutra Depository. This area is a library full of monsters like Monks. At the end of the quest line, you will have to fight the Chief Priest, who absorbs the power of the demons living in the depository, allowing himself to get corrupted. This page was last edited on 5 May 2016, at 04:56.